October home price growth increased 7.6 percent year over year to a national median sale price of $288,000 across Redfin markets. Homes on the market decreased 12.2 percent — the steepest year-over-year inventory decline since 2013. Year over year, homes on the market declined by more than 50 percent, shooting prices up to a medium $1.05 million (19.2 percent). Most homes in Seattle found a buyer in 10 ten days, 3 days less than the same time a year ago, followed by San Jose (12) and Boston (14), Oakland (15) and San Francisco (15). 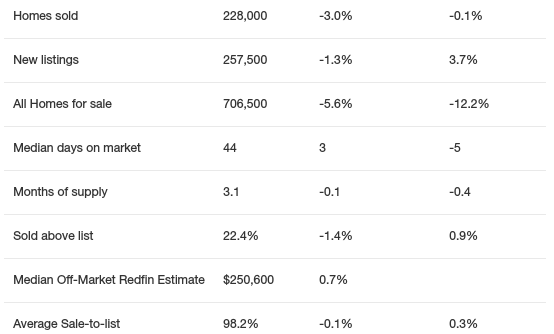 San Francisco remained the most competitive market, with 78.6 percent of homes selling above list price, followed by San Jose (76.3 percent), Oakland (63.7 percent), Seattle (45.6 percent) and Tacoma, Washington (42.8). San Jose saw a 19.2-percent price growth year-over-year to $1,049,000. Seattle came in second with 16.5 percent, followed by Las Vegas (14.6 percent), Oakland (13.1 percent) and Salt Lake City (12.6 percent). Baton Rouge home sales fell 20.3 percent, the largest sales drop since last year. Fort Lauderdale sales dropped by 18.0 percent. San Jose’s overall inventory had the largest decreased (51.6 percent) since last October. Followed by San Francisco (-28.5 percent), Atlanta (-27.8 percent) and Buffalo (-26.7 percent). Out of 74 metros, only eight reported a year-over-year increase in inventory: Raleigh (16.1 percent), Baton Rouge (12.9 percent), Austin (8.8 percent), New Orleans (7.5 percent), St. Louis (4.8 percent), Dallas (4.1 percent), Nashville (2.7 percent) and Allentown (2.5 percent). There were 4.6 million (4,628,408) U.S. properties that were seriously underwater at the end of Q3 2017, down by more than 800,000 properties from the previous quarter and down by more than 1.4 million properties from Q3 2016 — the biggest year-over-year drop since Q2 2015. 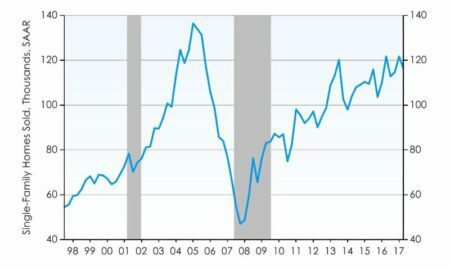 The 4.6 million seriously underwater properties at the end of Q3 2017 represented 8.7 percent of all U.S. properties with a mortgage, down from 9.5 percent in the previous quarter and down from 10.8 percent in Q3 2016. 14 million equity rich U.S. properties represented 26.4 percent of all U.S. properties with a mortgage, up from 24.6 percent in the previous quarter and up from 23.4 percent in Q3 2016. Among 93 metropolitan statistical areas with a population of 500,000 or more, the highest share of equity rich properties were in Hawaii, California, New York, Oregon and Washington. States with the highest share of seriously underwater properties were Louisiana (19.2 percent); Iowa (14.2 percent); Pennsylvania (14.0 percent); Mississippi (13.8 percent); and Alabama (13.7 percent). 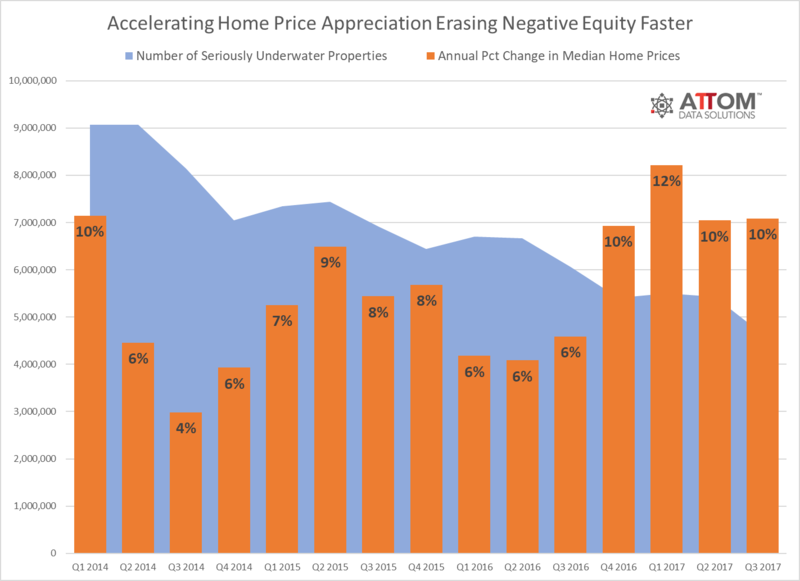 “Accelerating home price appreciation this year is increasing the velocity at which seriously underwater homeowners are recovering home equity lost during the Great Recession,” said Daren Blomquist, senior vice president at Attom Data Solutions. “Median home prices nationwide are up 9.4 percent so far in 2017, the fastest pace of appreciation through the first three quarters of a year since 2013. Continued home price appreciation is also helping to grow the number of equity rich homeowners across the country compared to a year ago,” he added. Single-family home sales in the Phoenix housing market fell 4.3 percent in the second quarter from the same time period one year ago. The Second Quarter 2017 Economic and Single-Family Housing Market Outlook Report for Phoenix found a strong and resilient market diminish slightly as the homeownership rate fell over the past year to 62 percent, below the national average of about 64 percent. Existing home sales in Phoenix fell in the second quarter to a seasonally adjusted annual rate (SAAR) of 116,435, or a 4.3 percent year-over-year decline. Inventory of homes for sale in Phoenix fell again to 20,188 on a seasonally adjusted basis, 11.6 percent lower than one year ago. Housing starts and completions rose sharply in the second quarter by 23.4 percent and 16.5 percent respectively. Completions were still down 67.4 percent from their prior peak and housing starts were 66.5 percent lower, so oversupply is not yet a concern. Phoenix home prices continued to outpace the U.S. average with an 8.2 percent year-over-year jump. The median home price stood at $239,427, which is still below pre-recessionary levels, suggesting there is more room for prices to grow. 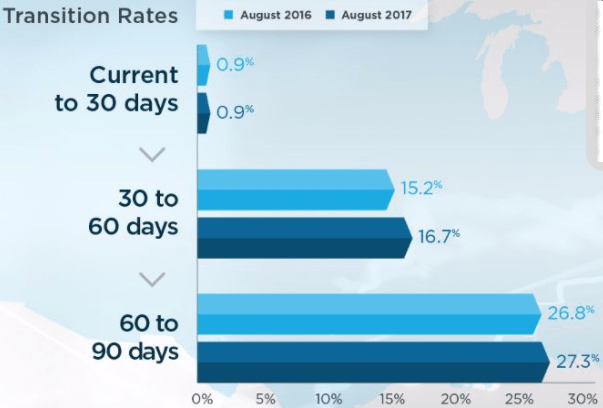 The 30 days or more delinquency rate for August 2016 was 5.2 percent. In August 2017, 4.6 percent of mortgages were delinquent by at least 30 days or more including those in foreclosure. This represents a 0.6 percentage point decline in the overall delinquency rate compared with August 2016. As of August 2017, the foreclosure inventory rate was 0.6 percent down from 0.9 percent in August 2016. The share of mortgages that transitioned from current to 30-days past due was 0.9 percent in August 2017, down from 1.2 percent in August 2016. U.S. median home sales price in 2016 was $236,000, 2 percent higher than in 2006. 31 of the 50 largest U.S. metros are back to pre-recession price levels. Austin, TX, has seen the largest price growth in the past decade: 63 percent. It’s followed by Denver, at 54 percent, and Dallas, at 52 percent. Nationwide, realtor.com data show that listing prices have been up by double digits for the majority of 2017. 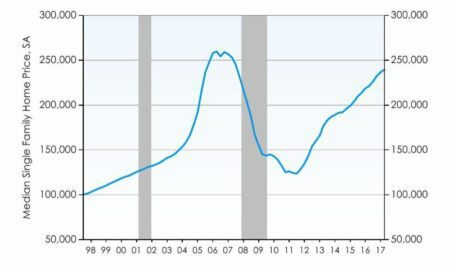 The biggest change on the housing scene over the past decade is that lending standards are the tightest they’ve been in almost 20 years. The median 2017 home loan FICO score was 734, significantly up from 700 in 2006. The bottom 10 percent of borrowers have an average FICO of 649 in 2017, up from 602 in 2006. In October, unemployment hit a 17-year low, at a rate of 4.1 percent. In 30 of the 50 largest U.S. metros, unemployment is less than half of 2010 levels. In September, employment reached 79 percent in the 25-34 age group, back up to 2006 levels and 5 percent higher than 2010. There are 600,000 fewer total housing starts and nearly 700,000 fewer single-family housing starts. 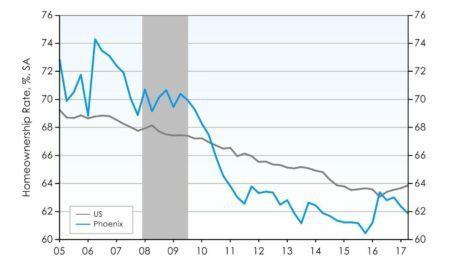 Las Vegas; Tucson, AZ; and Riverside, CA — remained more than 20 percent below 2006 price levels at the end of 2016, at 25 percent, 22 percent, and 22 percent, respectively.